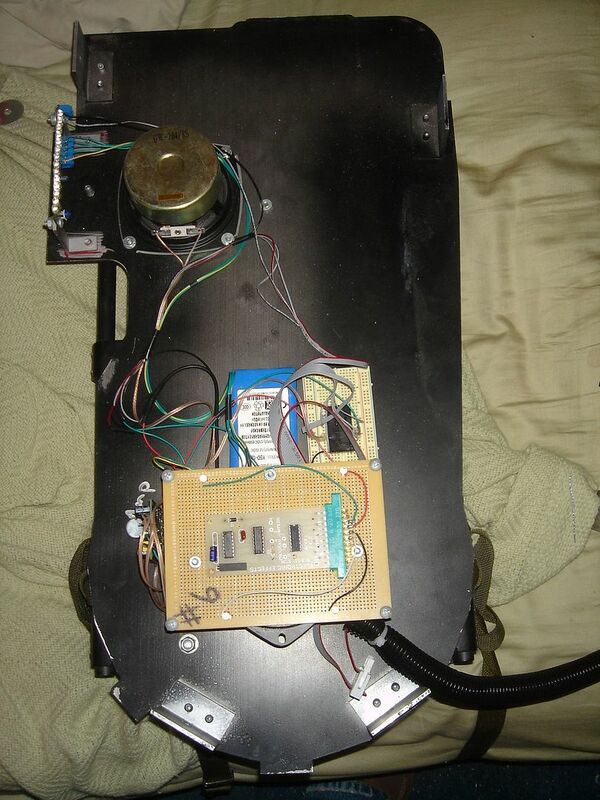 So you have just got done building your amazing proton pack! It sits proudly there in your mom's dining room, ready to impress with its amazing lights and cheerful demeanor. But wait, its awesomeness falls on deaf ears! Well, if you have a little bit of time on your hands and can look at pictures, you are in for a treat! Welcome to the Replica Props Do-it-Yourself sound project tutorial! Now before we proceed, you must realize that by following this tutorial, you will be modifying your current light kits. If you are not comfortable doing this, please do not try to do this without help. You build and install this sound system into your pack AT YOUR OWN RISK! Also note that I will NOT build you one of these either, This thing is easy people, don't be afraid to try! First and foremost, you will need to gather the parts to build this sound system. Sound Board model- the heart of this sound system. When ordering, you don't need to upload a zip file with the sounds, you just have to select proton pack from the options. The difference between the 1m and the 4m is the 4m adds the GB theme song and a extra hum loops sound, but removes the volume up and down feature the 1m has. Most people never use the volume feature any way because they control the volume through the canakit amplifier. I used the C&K Components push button because the plunger is plastic instead of metal. I was able to shave it down with a razor and take the black plunger off an accurate push button and glue that sucker onto this button to make it look more accurate. It's a little daring for some, but if done right, can look great in the end. You have lots of different ways you can get a 12v power supply for your amp and lights, these are just some suggestions. *Note* If you go this route, you will also need a 9v snapconnector which is only $1.99. Probably the best, rechargeable power source you can use is the 12v CCTV rechargeable batteries that are listed on Ebay. They range in ampere hour (Ah), so I would say stick with one between 4600mah and 9600mah. This would be the solution I would most recommend. You will also need other things that you can find at your local electronics store such as 20 gauge wire, speaker wire, heat shrink tubing (to make it look pretty), wire striper, soldering iron and solder, or for those that are soldering impaired, this can be helpful: Wire Glue. Now that all the supplies are out of the way, let’s put everything together! Now everyone one's lights on their pack are wired differently and everyone is going to want their sound hooked up differently too. 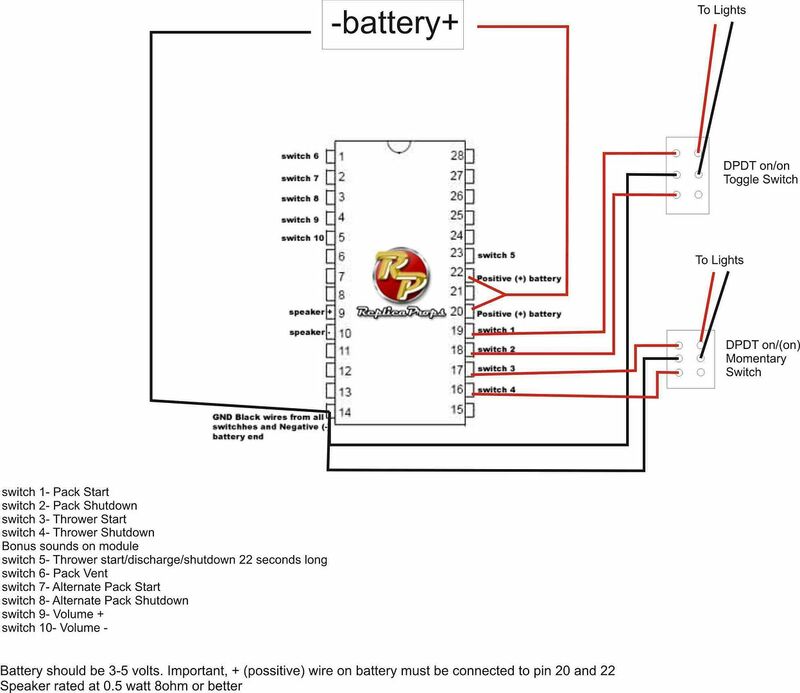 So this tutorial is only going to show you the basic idea behind how to wire it up. We cannot be supplying a different write up for every possible way you may have your lights hooked up in you pack. On the subject of different light kits, please double check that your particular light kit can take a 12v power source! We don't need you firing your lights. If you do not know, contact the person that manufactured it to double check. First thing is first. Let us wire up the actual sound chip. I suggest installing the sound chip onto a Bread Board. By doing this, if there is anything you need to change down the road, it will be a lot easier and cleaner to use the Bread Board. This is extremely easy. First let me explain the bread board. If you look at this picture of a bread board that is similar to the one listed above, I will explain how these are set up. Notice how each row is numbered and each column is lettered? Basically, each numbered row is connected in that section of the bread board. And example would be row 1. In row 1, the holes "A" through "E" are all connected. So if you were to put a wire into 1A, holes 1B through 1E are all connected to that wire now. So if you need to connect 2 wires together without soldering, you would place one wire into row 1 and then place the other wire it needs to be connected to within row 1 (A-E) as well. They will then be connected. The 2 outer sets of columns on this bread board are set up differently than the 2 inner sections. If you look, there is a red line and a blue line, with a "+" and a "-" above each column, respectively. This time, everything in each column will be connected, instead of each row (like what was explained about columns A through J). An example of this would be if you are using the right most "-" or blue column as your ground, you would have the ground to your battery plugged somewhere into that column. Now any other wire that is plugged into that column will connect to the ground. Now that that is explained, time to wire up the sound chip. Follow this diagram that robwerden made. 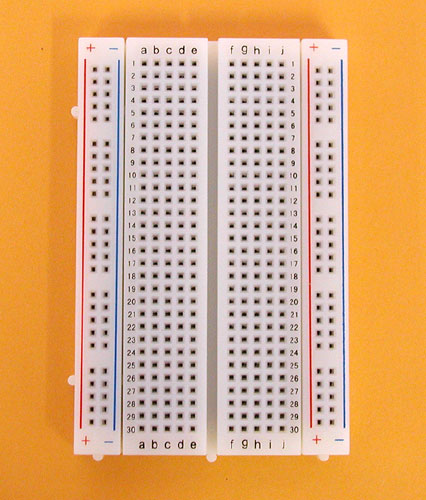 By using the simple set up of the bread board that I explained earlier, you can easily just plug the sound chip into the bread board and then run wires to the same row as the terminal of the sound chip they need to be attached to. It is very simple. I would also suggest hot gluing the wires into the bread board then to make sure they do not come loose. Here is a picture of the bread board with all the wires installed. PLEASE REMEMBER THAT A 3V TO 5V POWER SOURCE IS NEEDED FOR THE SOUND CHIP, DO NOT PLUG THE CHIP INTO A 12V POWER SOURCE. YOU WILL FRY IT. Also note that Rob programs the chips with extra sounds and functions, such as the volume control. You may install buttons/switches to these if you wish. You just have to run a wire from the terminal on the sound chip to the switch, then a wire from the switch to a ground. The amp is also extremely easy to hook up. 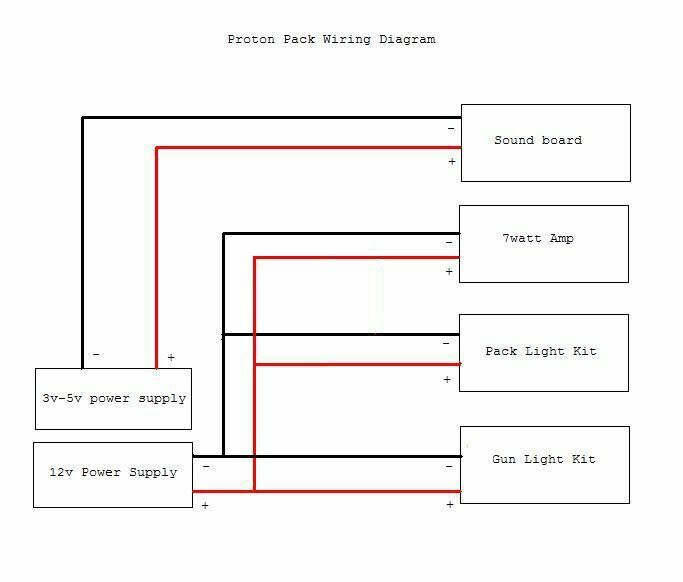 Basically, just follow this wiring diagram. Make sure you test out the amp before you permanently solder/wire glue them onto the amp. Best way to do this is to strip the end of each wire with wire stripers, bend the bare wire into a loop, and hook it onto each respective terminal. I find it better to test it first then to regret it later. 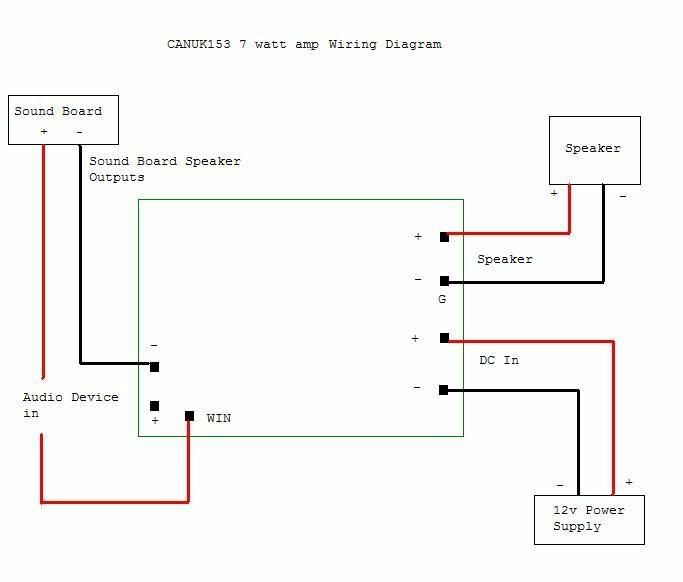 Also note when hooking up the wires to the amp, because the sound chip has .5 watt amplification programmed into it, you will need to wire the "positive" speaker wire coming from the sound chip to the "WIN" terminal on the "Audio Device" side of the amp. The "WIN" terminal is for powered audio devices (like a walkman. . . or a replica props sound chip!). There are a couple of different ways you may get power to your lights, sound chip and amp. I personally changed my power source for my lights to a 12v battery and hooked up my amp to that supply as well. When doing this, please make sure your lights can handle a 12v power source. Another thing to consider is that the amp does not have an "On/Off" switch and you will want to cut power to it when you are not using it or it will drain your batteries. I personally wired my amp to the ground wire coming off my pack lights so my amp only gets power when my pack lights are on. Another option is simply hooking the amp to its own switch. Just run a positive line from the positive terminal on your 12v to a switch. Then from the switch, run another wire down to the positive terminal of the amp. Lastly, run a wire from the negative terminal of the amp to the negative terminal on the battery. An alternative to this option is running the amp to a DPDT toggle switch (similar to how the sound chip will be wired to the new push button and toggle switch you will need to install in your gun which will be detailed in the next section). Which option you ultimately go with depends on how your lights are set up to begin with. 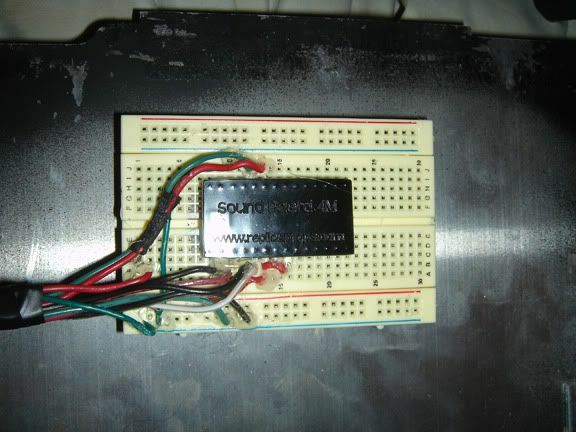 As for powering the sound chip, it needs a 3v to 5v power supply. The easiest way to attach this is by using the 2 "AA" battery holder listed above. Just wire the closed battery holder to the chip. I would recommend rechargeable batteries so you will not have to buy new batteries all the time. Also note that the sound chip has a sleep mode, which it goes into when not being used. Because of this, I see no need to wire up an "On/Off" switch for the sound chip. Once again, please look at robwerden's diagram he has made of his sound chip. This will be helpful in the next step. The idea here is to change out your "Intensify" push button and another switch on your gun to DPDT Switches. DPDT switches are essentially double switches. There are 6 terminals (2 sets of 3 on either side) on the bottom of each switch. The first thing to do will be remove your light kit's positive and negative wires from the old switch and attach them to the new on. Word of the wise: once you strip the ends of each wire, loop them through 2 of the terminals on one side of the switch and test the button before you solder/wire glue them on there. Make sure the switch does what it's supposed to do! If it does not, then take one of your wires, and move it from the first terminal to the third terminal on that side of the switch and try again. Make sure the lights work correctly with the new switch before you move on. Now that your lights work correctly with the new DPDT switch, it is time to attach the wiring from the sound board to the switch. Please look carefully at robwerden's diagram. The "ground" wire will always be attached to the middle of the three terminals on the switch. Then one sound wire is attached to either the first or third terminal on that side of the switch. Once again, before soldering or wire gluing the wires to the switch, please test them to make sure they work correctly first. Now with everything installed, you should now have sound in your pack! Congratulations, now you can impress your mom with how loud your pow pack is.